I’ve been talking a lot over the past few years about the opportunity for Austin to become a leader in brain health just as MD Anderson exemplifies cutting-edge cancer care or the way the Cleveland Clinic pioneers world-class cardiac care. 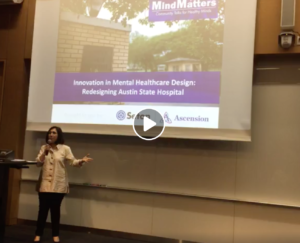 Through the Austin State Hospital Brain Health System Redesign, we’re seizing that opportunity and are on the cusp of something incredibly exciting that is so much bigger than just a new building. In 2014, an assessment of the state’s psychiatric hospitals found that five out of 10 were basically unsalvageble and the Austin State Hospital was among the worst. Last session, it was a top priority for me to get money into the state budget to develop a plan for replacing ASH with Dell Medical School at the University of Texas taking the lead in how that should look. Dr. Steve Strakowski, the chair of the psychiatry department at the Dell Medical School, led the redesign effort. His team worked with more than 100 people who know the mental health system from a variety of perspectives, including people with the lived experience of mental illness and their family members, ASH employees and outpatient providers, law enforcement, advocates and more. This past Monday night, Dr. Strakowski unveiled the plans for rebuilding the Austin State Hospital, and I’m optimistic that we’ll be able to get the funding from the Legislature this session to continue pursuing this vision. Back in late 2011, I challenged our community to achieve 10 Goals in 10 Years related to health care. One of those goals was to provide better mental health care. One was also to have a medical school at UT. We’ve made some significant progress in the area of brain health and, of course, we now have a medical school. It’s pretty great that our goals are being realized in large part because that medical school, which didn’t exist just a few years ago, is leading the way in providing 21st Century brain health. It’s easier to imagine rebuilding the Austin State Hospital, and that will be a big deal by itself. But even more important is the person-centered model of care the redesign team has developed. It’s aimed at providing folks the right care at the right time in the right place and ensuring the person is a partner in their own care and recovery. It’s not just a building. It’s a new system that changes medical aid and hospital care for all.